We ate a lot this week. There was food, food and more food! With my friend Michael visiting here (and the U.S in general) for the first time, I wanted to make sure he experienced several of NYC’s good eats. We had amazing Tapas and wine at Bocqueria in Soho. We had beer and French fries at Connolly’s in midtown. We had deli sandwiches at Katz’s on the Lower East Side and Italian at Briciola in Hell’s Kitchen. We had salad bar (mostly Indian food) at Whole Foods in Columbus Circle and cheese from Murray’s at Grand Central. Sadly, there was no time or room left for pizza or dirty water dogs or even diner fare. We’ll have to save that for next time. Last night, to celebrate his birthday, we had a terrific meal at Blue Water Grill. I don’t think you can go there and not have a great meal. The service is tailored to helping you find exactly what you like. From the wine straight through to dessert- kind, knowledgeable, meticulous and impeccable service. We started the meal with Hendricks Gin and tonics. Off to such a great start, we knew it was only going to get better from there! Michael had a half dozen oysters and determined that he preferred the west coast ones over the ones from the east coast and six was just not enough, so we ordered six more of just the variety he liked. I am a fan of neither, or any, for that matter, so I didn’t partake. However, my pumpkin ravioli was simply amazing and I almost forgot to share a bite! Made with pine nuts, fried sage, shaved pecorino and served in a creamy brown butter sauce, this ravioli was lighter than I expected and I could have eaten a whole bowl of just this for certain. Michael thoroughly enjoyed the simply grilled Red Snapper, with potatoes and broccolini while I feasted on the grilled branzino (which they removed the tail from upon my request) with butternut squash, fried Brussels sprouts, gala apples and fig vinaigrette. It was such a great dish there was nothing left! Both were delicious, but I secretly think mine was better! We had also ordered a side of steamed baby spinach with golden raisins and pine nuts as well as their creamy. three cheese polenta. By the time we finished a bottle of wine and all this food, and walked around the block (not really but we should have) it was time for dessert- a caramelized banana ice cream tower- a tasty hazelnut shell, toasted marshmallow sauce, home made ice cream, and chocolate sauce. Well wow! That’s a decadent dessert and worth every last calorie bite! Sorry there were no pictures of this special celebration dinner. Just trust me when I say it was divine. Still full from last night’s extravaganza we had a small breakfast of yogurt and cereal and made our way uptown just in time for lunch. Michael really wanted to try an American steak. The steaks you get in Europe are nothing like the giant slabs of meat you get here. The concept of just meat on a plate without any type of side just isn’t the norm. I went through my mental list of the best NY steak houses- Smith & Wollensky, The Palm, Frankie & Johnnie’s, Sparks (with it’s notorious Mob hit), Old Homestead and Peter Luger’s. 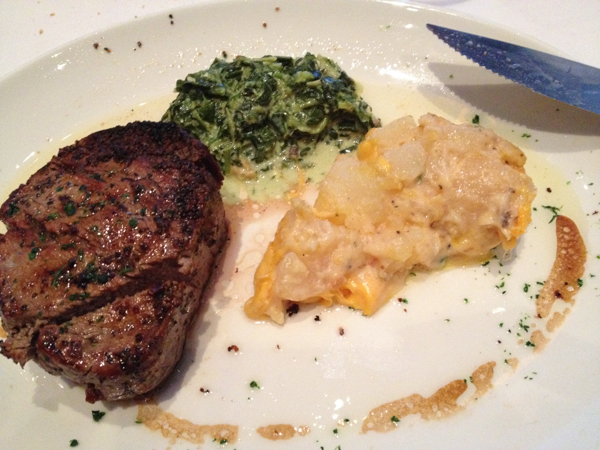 But my mind settled on one of my personal favorites- Del Frisco’s. 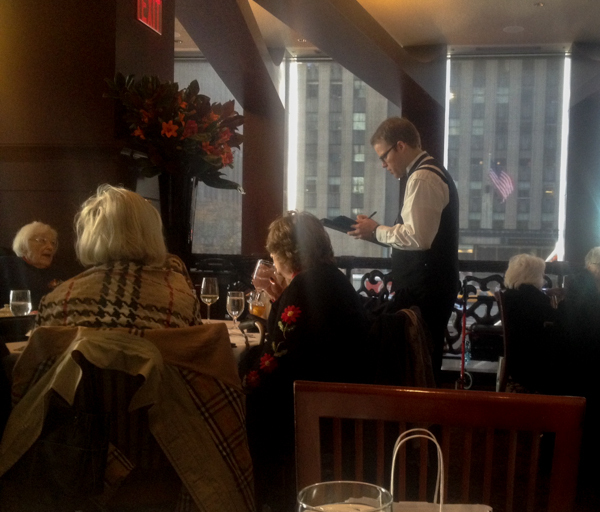 Hands down, Del Frisco’s is the best steakhouse in the city- in my humble opinion. The wine list is vast and impressive and the bread is so good and rather dangerous- because once you start eating it, you can’t help but keep eating more of it. But try your best not to fill up because the best is still to come. Here, I skip appetizers because it is just too much. And I’m there for the meat. Michael on the other hand had the crab cake- which is not a breaded crab cake at all. It’s simply a pile of crab, held together by a mixture of red peppers, corn and onions. There is also a very little bit of mayonnaise in there to act as a binder, but not much else. The result is simply wonderful. 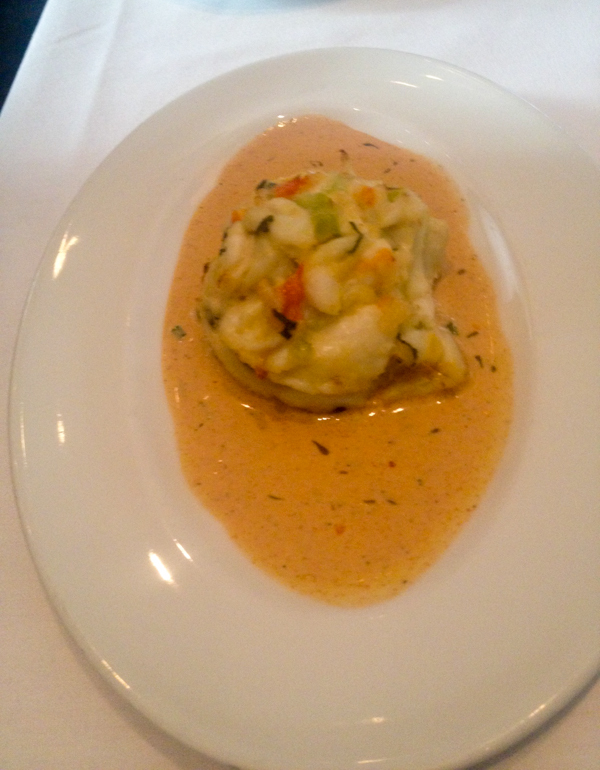 Jumbo lumps of crab that is perfectly sweet and served with a zingy Cajun lobster sauce. Not your typical fish cake! I had the filet (as always) and he had the bone-in filet, an off the menu regular special. While the bone in filet was perfectly tender, the bone does require a bit of knife work clean all the meat off- you may actually be tempted to gnaw on the bone- but please don’t- unless you take it home- then by all means! The bone-in filet- Look at the thickness of that meat! Wow! 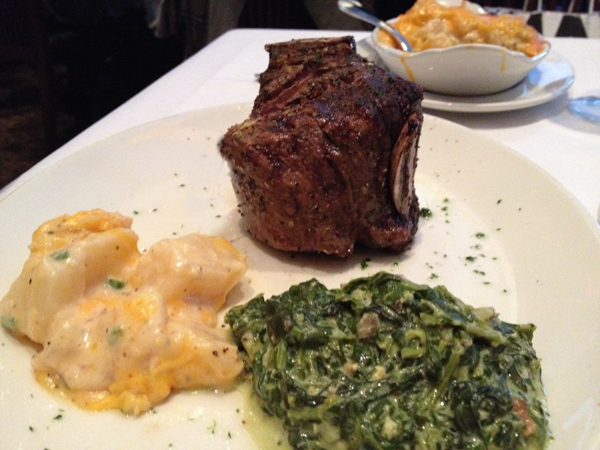 The creamed spinach and gratin potatoes are the standard sides ordered. They just seem to be the perfect steakhouse side. It would have felt weird to deviate too much from these this time around. NYC Steakhouse authenticity and all. When I say we cleaned our plates- we took our time and ate every last bite of meat- there was some serious carnivore action happening. It was amazing! And surprisingly, there was no unbuttoning of pants or the feeling of a food coma… yet. We even had room for dessert! 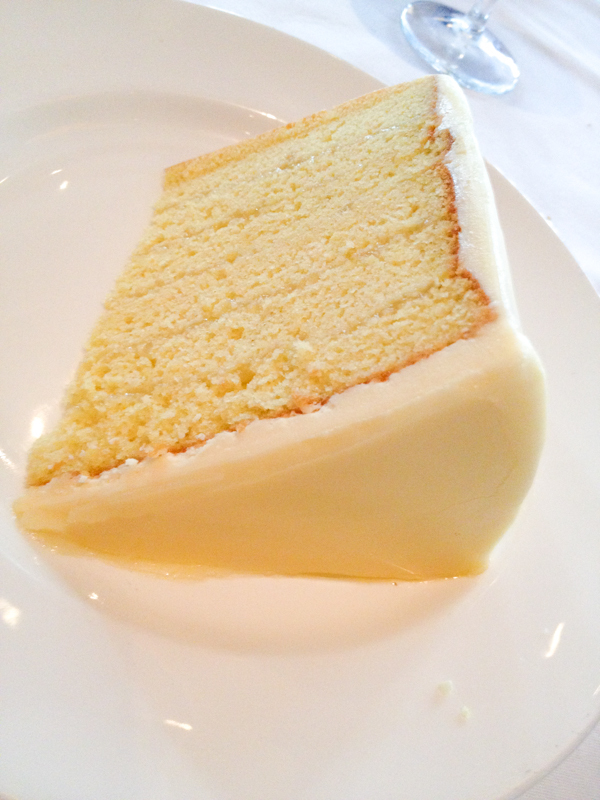 The choices were tough, but we skipped the chocolate cake and the cheesecake (which could really serve 3-4 people a slice) and opted instead for the 6 layer lemon cake-which is also enough for several people! I ended up taking more than half of it home- it made for a great midnight snack. All in all I don’t think we had a bad meal. Not one!